What is an "eBook" and how can I read it? What advantages does an eBook have? Can I get a printed version in a bookstore, too? Who is the author of the eBook? Do I really get my money back, if I am not totally satisfied with the eBook? An "eBook" is an "electronic book", that means a book in a digital version. You can read an eBook on your computer (Windows und Apple Macintosh) just as you can read this page right now. Besides you can print an eBook by yourself, if you prefer to read it on paper. You don't have to care about going to a bookstore or delivery costs, when you buy an eBook. Buying with your credit card, you can download the eBook anywhere and at any time and start reading immediately. Additionally, we can offer you an eBook for a smaller price than a printed book. All in all you are saving money and time buying an eBook. 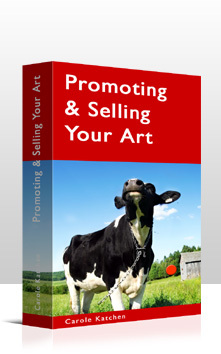 You can buy "Promoting & Selling Your Art" here as an eBook exclusively. You can't get it in any bookstore. But you can print it anytime yourself, if you want to. 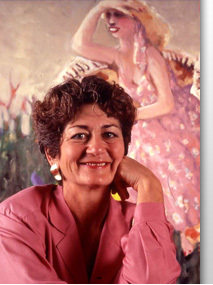 The author of the eBook is the successful american artist and bestselling author Carole Katchen. The owner of this website and the publisher of the eBook is Matthias Klopp, owner of an marketing agency and running the internet platform www.kunst.ag for artists (Germany, Austria, Switzerland). Of course, you can rely an our money-back-guarantee. After the purchase you have 6 month to ask for your money back. We will refund it immediately no questions asked, no strings attached. Just send us an e-mail.